← Britains at it again!! Gold Gold Gold!! Mo Farrah to start the Great North Run!! 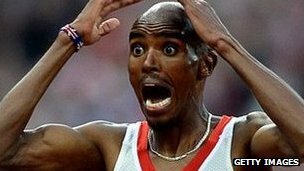 Mo Farah will be among five London 2012 gold medallists to perform the role of starter at the Bupa Great North Run. Up to 55,000 people are expected to take part in the famous half marathon on 16 September. WOW!! Farah had been due to compete for the first time but has withdrawn as he has not had time to train for the distance, well he has been mega busy with the Olympics you can hardly blame him!! As honorary starter he will be joined by more Olympic heroes rower Kat Copeland, long jumper Greg Rutherford, boxer Nicola Adams, and Paralympic swimmer Ellie Simmonds. He said he was looking forward to “high-fiving as many people as possible” at the start of the race, so if your there keep a look out for him and you can maybe get a high five!! Enjoy the Great North Run!! This entry was posted in Olympics! !, Sports News!, Uncategorized and tagged Great North Run 2012, Mo Farah, Olympics. Bookmark the permalink.